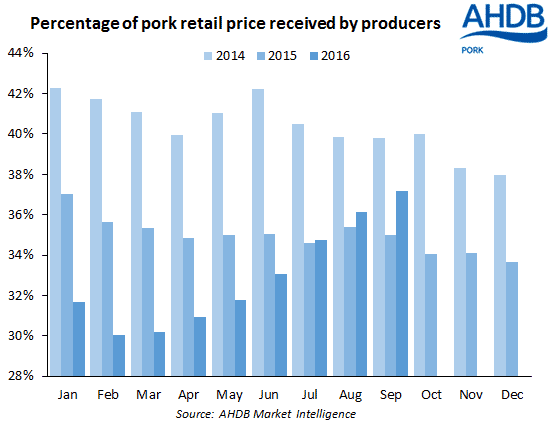 UK - The producers’ share of retail pork prices has now been rising for six consecutive months, reaching 37 per cent during September. This was 1 per cent up on the previous month, and 2 per cent higher than the same period last year. However, the share still remains 3 per cent lower than the 40 per cent stake enjoyed by producers during September 2014. The continuing increase in GB pig prices was responsible for raising the producers’ share of pork retail prices last month. The retail price remained static during September, at a level 1 per cent below that seen at the same point in 2015. Meanwhile, the EU-spec APP climbed 4p/kg on the previous month, and was a substantial 7p/kg higher than the September 2015 price. Despite overall retail prices remaining stable, there was movement in the price of individual cuts. Fillet end leg reported a price increase of 4 per cent on the previous month, while boneless leg and shoulder cuts also showed price increases of 2 per cent and 1 per cent respectively. Most other cuts showed small price falls of 1 per cent during September this year, with the exception of minced pork which declined 2 per cent. Compared to September 2015, the trends are again mixed. The price of many cuts has fallen, including sausages, diced pork and loin steaks (-4 per cent), loin chops (-3 per cent) and minced pork (-2 per cent). These price declines have been partially offset by other cuts increasing in value during this period. Fillet of pork showed the most substantial increase in retail price of 3 per cent. Fillet end leg was also up 2 per cent on the year, while boneless leg and shoulder increased in price by 1 per cent.